Web-based, mobile-enabled Survey Builder & Poll Management software with advanced features for creating questionnaires & online surveys to analyze the results in real time. As survey plays a vital role to get an accurate picture of reality, every organization need to conduct surveys to improve themselves. Nowadays organizations prefer to conduct surveys with less human intervention. A good survey provides you actionable, clear information to guide your decision-making. Online survey is a powerful research tool that can deliver Instant feedback from a large number of targeted audiences. Most free online survey tools give you access only to a limited number of question types thereby restricting you from fetching the feedback you need. EagleView is an online Survey Builder Tool with advanced concepts such as customized questionnaire preparation and reports on the basis of the survey. EagleView assists you to create questionnaires & online surveys in minutes and view the results in real time. Conduct online surveys through EagleView Survey Builder Tool which provides a wide choice of questionnaires and analyze the outcome with ease. Eagle View provides multiple question types handling most complex survey logic to meet various survey requirements. It is a comprehensive online survey tool to create survey, configure a welcome message, preview the created survey, and publish the survey to collect the responses. Eagle view is an online application with advanced concepts such as customized questionnaire preparation and reports on the basis of the survey. 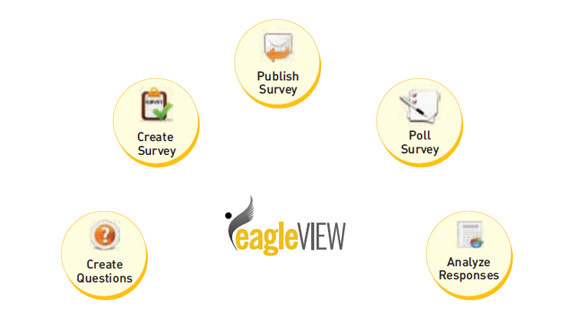 Eagle view assists you to create questionnaires & online surveys in minutes and view the results in real time. With unlimited number of questions and unlimited number of surveys Eagle view increases the effectiveness and efficiency of surveying. Besides, efficient data compilation and real time statistical data reports make eagle view a robust tool for online surveys.